Fleece is warm, soft, stretchy, colorful, non-ravelling, easy to wash, quick to dry and, best of all, simple to work with. With this book in the Kids Can Do It series, youngsters can make cozy blankets, snuggly hats and adorable stuffed animals. The projects can be hand- or machine-sewn, and in many cases, fabric glue can be substituted so that even kids who can't sew will be able to make these great fleece crafts. Simple step-by-step instructions, patterns, stitches and ideas are all included. I needed to make a jester’s hat for a school play and wanted to make a fleece one so it could be used again in the winter. This book provided a pattern and easy directions. The hat was fast and looked great. The patterns are easy enough for kids to make – great beginning sewing projects. 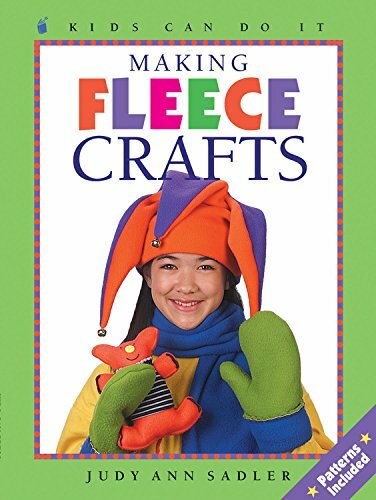 I teach sewing to children ages 5 and up and I was looking for some craft ideas when I purchased this book. What I found was some of the projects were too hard for beginners and some were “No Sew” projects. All in all it was alright for a crafting book. Cute ideas, and patterns that are very simple.